"...to set foot on one’s own country as a foreign land." I can tell you that an international relocation with three kids takes a whole lot of hard work and patience, and I'm sure I would have grown many more grey hair than I did, if not for help from my mum, younger sister and bro-in-law during our first week in Melbourne. 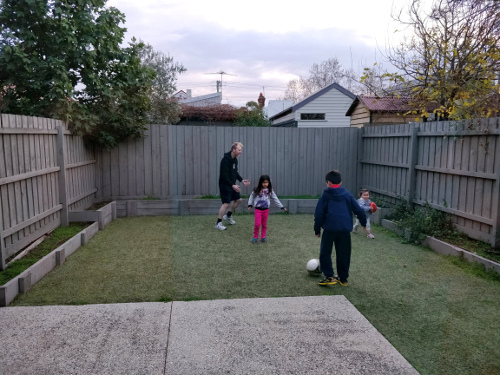 It is now about two months since we arrived in Melbourne, and it is only now that I can say that we have more or less settled into our new home. Though we often told our friends in Hong Kong that we were "moving back to Australia", Melbourne is still a new city for us to live in, and there is much to experience and explore. I would like to continue blogging, at the very least to document our epic trip to Europe where we covered 12 cities and towns in 5 countries, covering 2400km with 3 kids in 28 days - it sure took a lot of balls, guts and grit to make this trip happen! But for now, here's a shot of the kids and their dad playing in the backyard while I cooked dinner. The garden is the probably the one thing that the kids are most excited about this house, because it means they can finally have a pet dog. I've been reading your blog for a long time but never commented. I really hope you carry on blogging, especially now you've moved from the city I grew up in, to the city I lived in for years.